From the shore, Harbour Island may seem out of range. Yes, there are monstrous mansions that surround the water-front property and almost all of the residential communities come with a security guard and famous Rays, Lightning, Yankees, and/or Buccaneers player resident. 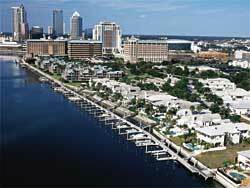 But even if you can’t afford to live on an island with Tampa’s elite, you can visit their local establishments and indulge in a nice meal or cocktail in one of their local waterside restaurants.